Hello! This is all new. The Website is new. This Blog is new. It’s the very first time I’ve ever blogged and I’m so excited… and, a little scared. This whole platform is quite daunting for me, and I’ve been reluctant to start a blog. What do I have to say? Would it be helpful to anyone? My hope is I will have something to share and that it will be helpful to someone. Maybe you?! Even after the frustration of not knowing what I was doing, I really enjoyed the process of modifying this WordPress theme and finally pulled it all together. Elegant Themes has produced some wonderful tutorials (thanks so much – ET). It seems I’m happiest when I am learning new things—challenging myself—and creating this Website was no exception. The year has started, fresh and new, and the days are already getting longer. I’m looking forward to a great 2017. Last year was a bit of a tough year, ending with my mother passing away just before Christmas. I am deeply saddened by the loss, but know there is peace there, too. She will be missed very much. RIP, dear sweet Mom. Currently, I’m working on a series of paintings for an upcoming solo exhibit titled, Questions of Significance to be held in Durango, Colorado March 3 – April 29, 2017. Below is the latest work in the series just off the easel. 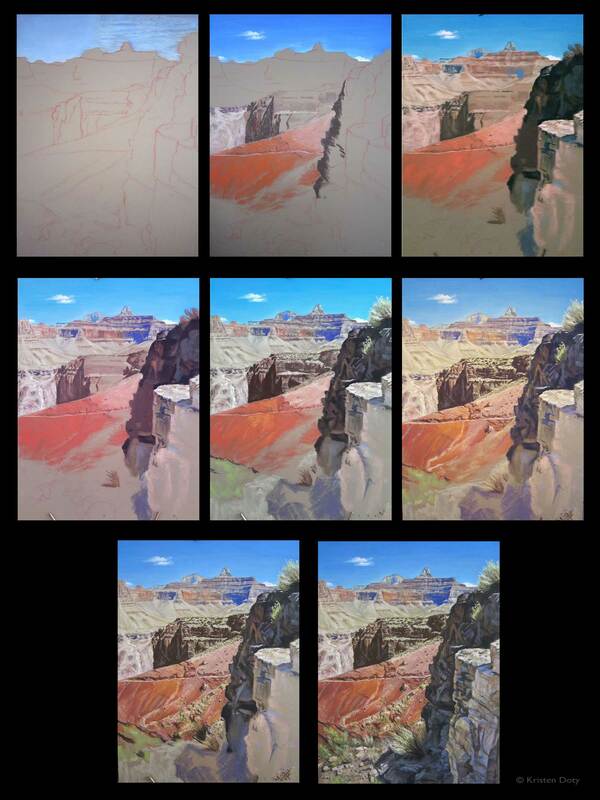 This painting was created with pastel on Ampersand Pastelbord, sand color. 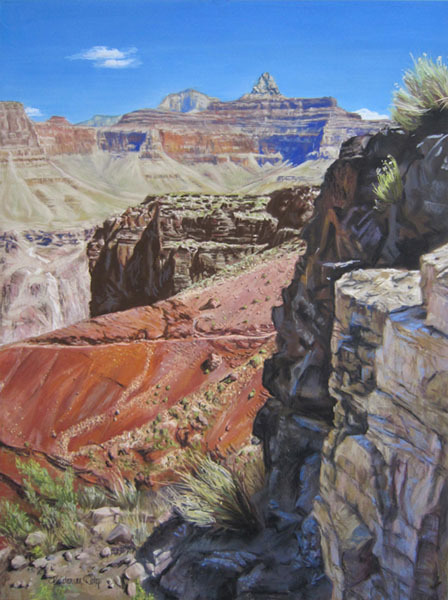 The title, Ages Upon Ages, alludes to the fact that nearly every rock layer in Grand Canyon is represented in this one painting. This view is from the South Kaibab trail, just below the Tipoff, at the beginning of the final steep descent to the river. Considered one of the top natural wonders of the world, Grand Canyon is an awesome place that truly lives up to its name. On this blog, I plan to post new artwork, works in progress, tips, news, and other art or studio related tidbits and musings. If you are interested in receiving new posts and other updates via email, you can subscribe to the mailing list in the sidebar, at right (or below for mobile devices). Thanks for reading! — Happy 2017!